My VCDX design architecture was based upon the EMC Symmetrix VMAX 20K. I spent a lot of time with EMC SMEs learning everything I could about it. The first step was learning the major building blocks of the VMAX and how it all fits together. The examples I provide below are with the vSphere ESXi host being the consumer of VMAX storage services. Be aware that buying a Symmetrix VMAX is like owning a McLaren F1 race car; consider yourself lucky to drive it at the track since everything else must be performed by McLaren. Every VMAX requires valid EMC support, even adding one disk or reconfiguring a Front-End port from iSCSI to FCoE requires an EMC Engineer to generate a “BIN” file to update the VMAX configuration; you cannot do any of this yourself. Furthermore, EMC support is second to none, EMC engineers will visit your site to replace a disk or component before you are even aware that there is a problem (via ESRS – see below). The Disk Shelf IOMs are connected to the System Bay by the “Matrix Interface Board Enclosure” (MIBE). The Directors interconnect via this “Virtual Matrix” as well. 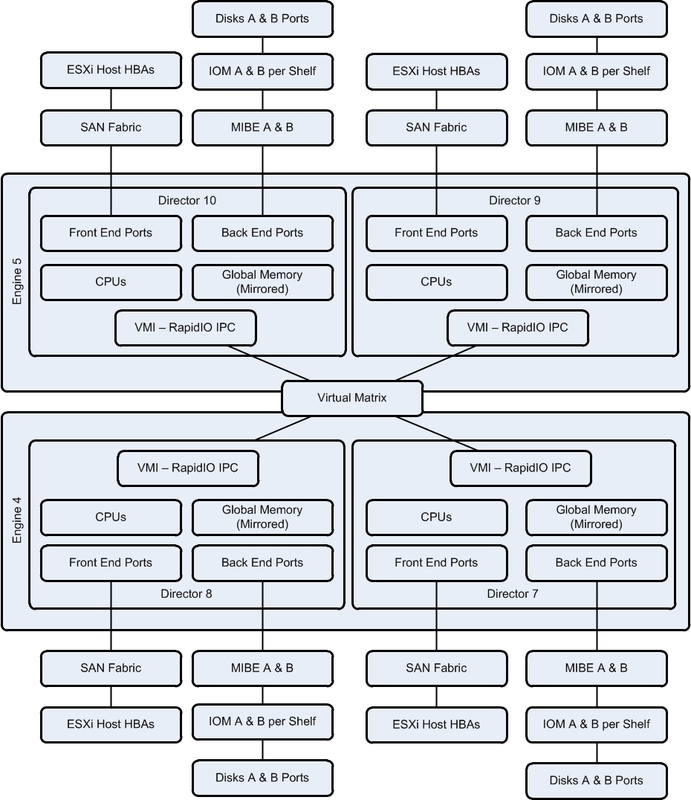 The diagram below illustrates an EMC Symmetrix VMAX 20K with two Engines connected to vSphere ESXi hosts via Fiber Channel. Thin Devices (TDEV) – Virtual volumes that are thin provisioned and then bound to a Thin Pool with striping. FAST-VP – Auto-Tiering policies that can be configured to run 24×7. Cache – Provides fast performance by keeping frequently accessed addresses in memory. Compression – LUN Compression can be enabled Thin Pools. The physical drives of the VMAX are collected into Disk Groups with the RAID configuration. The Disk Groups are then associated with a Thin Pool. The Thin Pool is the physical manifestation of the storage that is then virtualised through the process of “binding” with each Storage Group. 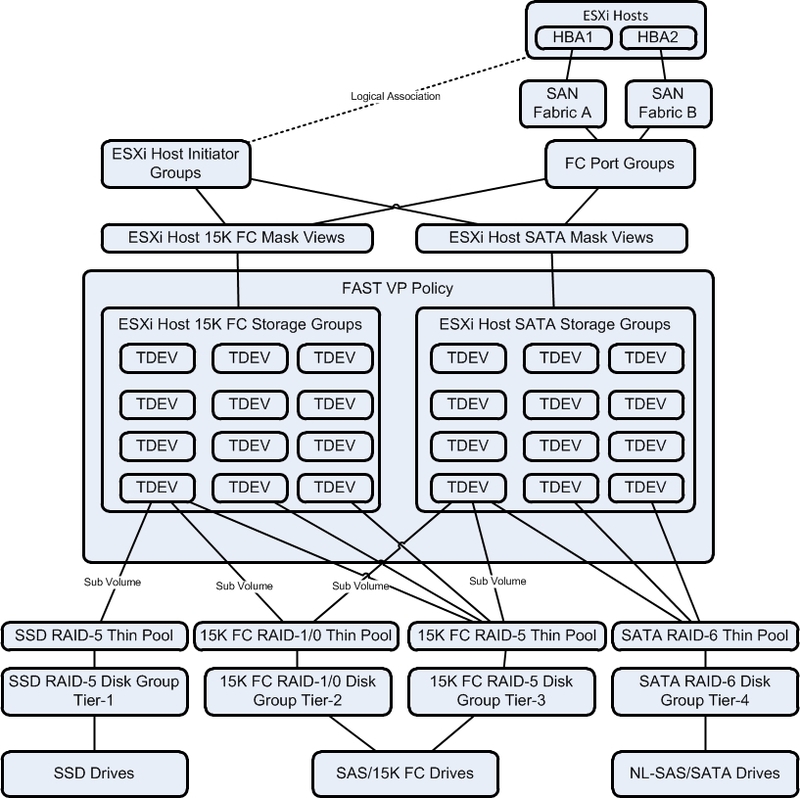 Each ESXi Host that requires SAN storage must have the following logical configuration. The linchpin of this configuration is the Mask View, which associates the Storage Group to the Initiator Group and the Port Group. The Initiator Group is merely the definition of the SAN address of the host that wants to connect to the VMAX. The Port Group is the collection VMAX Front End ports that connect to the outside world (FC, iSCSI, FCoE, FICON, SRDF). The Storage Group is the collection of thin provisioned virtual volumes (called TDEVs) that appear as LUNs to the host. Until the TDEVs are associated with a Thin Pool, they have no substance and are merely configuration objects. Once associated with a Thin Pool, the storage is then online. The Fully Automated Tiering for Virtual Pools (FAST VP) Policy is then applied to the Storage Group and configured to continually run. This optimises the Thin Pool storage by moving storage “hot spots” to faster storage tiers. 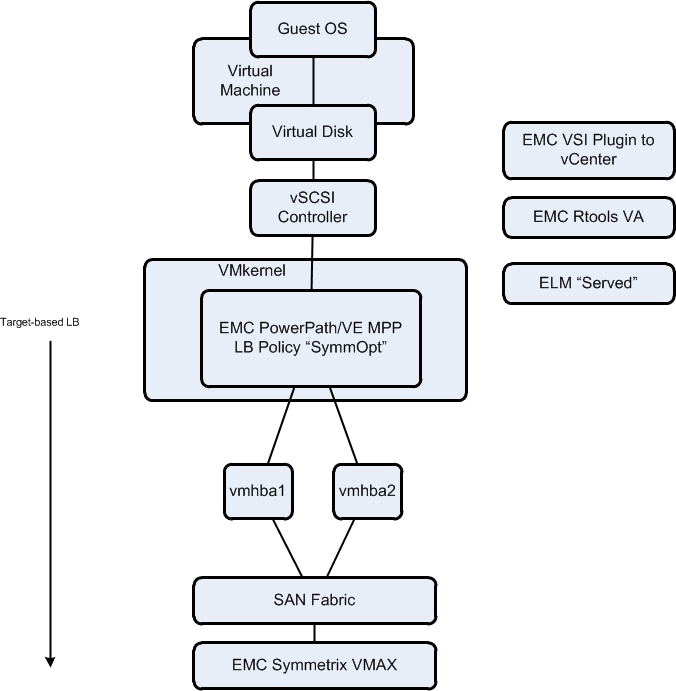 The diagram below illustrates an ESXi host with PowerPath/VE configured with the “SymmOpt” LB Policy, “Served” Electronic Licence Management, “Rtools” Virtual Appliance and the “VSI” Plugin for vCenter.